Oakland is consistently recognized as one of the most livable and sustainable cities in the nation! 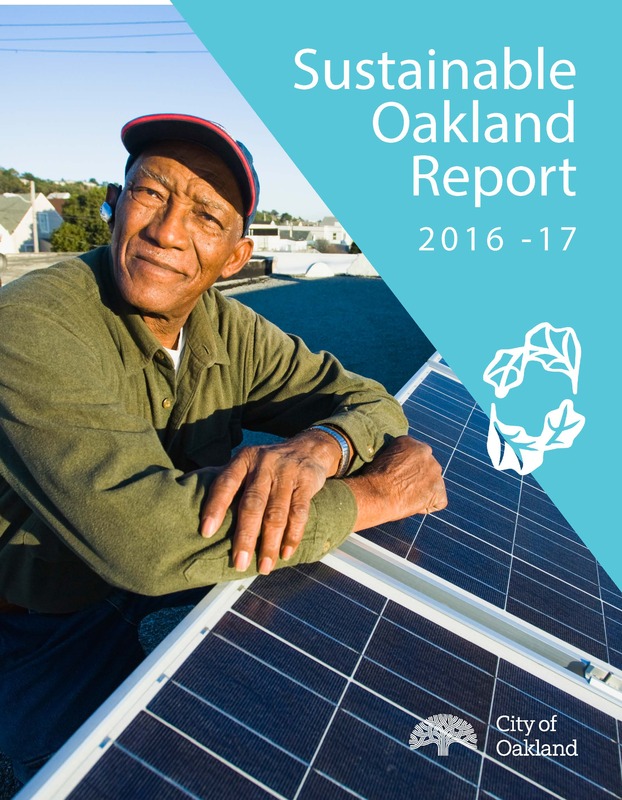 The City of Oakland is committed to leading Oakland's progress in becoming a more sustainable city – a community in which all people have the opportunity to pursue safe, happy, healthy and fulfilling lives, now and into the future. To plan for and adapt to the effects of rising ocean levels, the City has prepared a Preliminary Sea Level Rise Road Map. Building on multiple studies of the potential for sea level rise to affect people and property in Oakland, this Road Map sets forth the projections for rising Bay levels, the impacts of king tides and storm surges in association with these changes, identification of critical facilities, and a series of recommendations for how the City and the community can help prepare for these impacts. 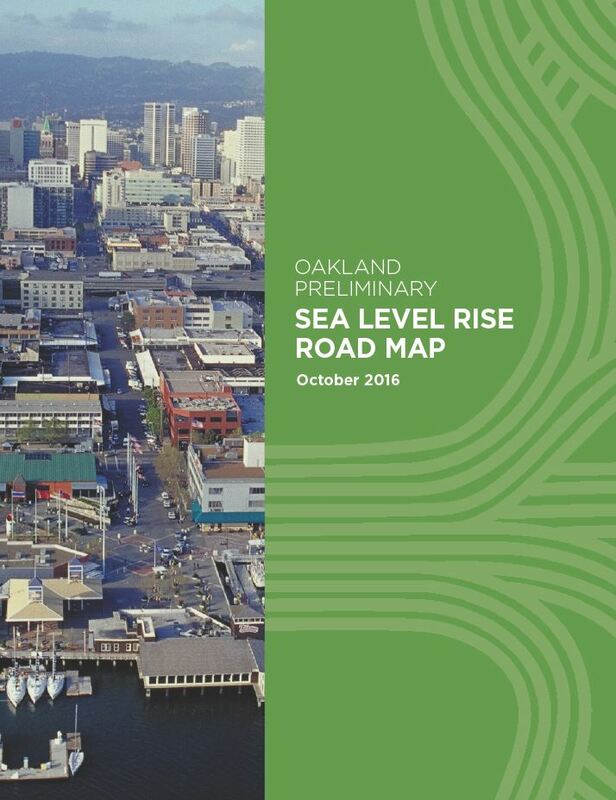 Download a copy of the Preliminary Sea Level Rise Road Map here. Want to Have a Clean Energy Home but Don't Know How? The best source of energy for your home is clean, renewable electricity. Methane, the key component of natural gas, is a greenhouse gas 84 times stronger than carbon dioxide. You can reduce your climate impact by decarbonizing your energy - eliminating natural gas and gasoline altogether. Think of it as one, integrated package of clean energy actions! It doesn't have to be done over night, either; planning ahead is the way to go. Click here for a simple, step-by-step guide on how to have a clean energy home. As of March 14th, 2017, Oakland builders are required to provide increased levels of plug-in electric vehicle (PEV) infrastructure in all new buildings, including design for compliance with state Americans with Disabilities Act (ADA) requirements for PEV infrastructure. The new requirements are designed to accelerate the installation of vehicle chargers to address demand and ensure that clean technologies will be available to all. Click here for a Fact Sheet explaining the new code. The full set of requirements can be found on the City's Municipal Code and Charter page, in Chapter 15.04, Part 11. 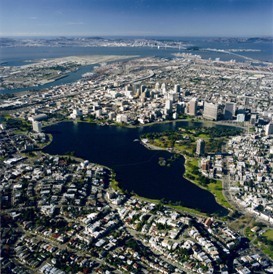 Read about Oakland’s recent progress in becoming a more livable and sustainable city. Download the 2016-2017 report. Find past reports here: 2015-16, 2014-15, 2013-14. The City of Oakland considers water conservation a high priority and an essential part of our commitment to being a sustainable city. See how the City of Oakland is reducing water use in its municipal operations, and some of the many resources, tool and strategies available to help residents to lower water usage and be part of the solution to the water crisis. Oaklanders reduced their greenhouse gas (GHG) emissions 14% since 2005: That is among the exciting findings in the city's updated GHG emissions inventory. The inventory tracks emissions from all sectors of the community, including residential, commercial, and local government activities. Click here to read the full report. 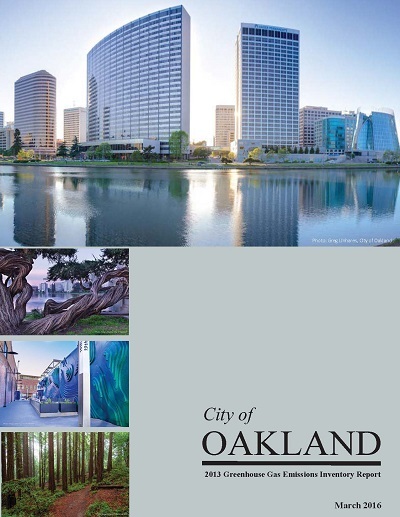 The City of Oakland’s primary roadmap for sustainability and climate action is now available in a revised and updated form. Oakland's Energy and Climate Action Plan (ECAP) was first adopted by the City Council in 2012. In 2017-18, City staff worked across multiple departments and with green business groups, social justice organizations, and environmental stakeholders to update the ECAP. The timeframe and greenhouse gas reduction goals are unchanged. The revised document reflects actions that have been completed or are fully underway, reprioritized actions, updated cost estimates, and the most recent greenhouse gas emissions inventory. Learn more about the ECAP. It is easier than ever for Oakland homeowners and commercial property owners to finance energy efficiency, water efficiency and renewable energy projects at low cost. On September 8, 2015, Oakland City Council authorized five Property Assessed Clean Energy (PACE) financing providers to operate in the city. With PACE, projects are financed on a homeowner’s or property owner's property taxes at low cost. You get to choose a contractor and install a custom, eligible clean energy project, such as efficient heating and cooling systems, solar panels, low-flow toilets, home insulation, drought-tolerant landscaping, or electric vehicle charging stations. This is another easy way to save energy and water, reduce your utility bills and be part of making Oakland one of the most sustainable cities in the world. 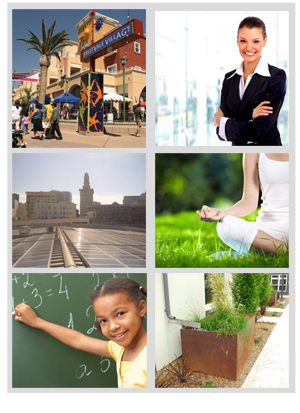 Click here to find a list of PACE providers in Oakland. Get up to $6,500 in rebates when you make your home more energy-efficient. Energy Upgrade California is a one-stop-shop for home improvement projects that will save you money, lower your energy use and make your home healthier and more comfortable. Learn how you can take advantage of these limited-time rebates, view a list of qualified local contractors, and get started today. In March 2006 the Oakland City Council adopted a Zero Waste Goal by 2020 and in December 2006 passed a resolution adopting a Zero Wastes Strategic Plan. Green Building Ordinance for private development adopted. To sign up as a site coordinator, register as group or individual to volunteer, or for more information visit www.oaklandearthday.org. Explore the interconnected Sustainable City Performance Areas below to learn more about Oakland's sustainability performance, achievements and resources. The City of Oakland's landmark Energy and Climate Action Plan (ECAP) was adopted by Oakland City Council on December 4, 2012. Learn more about the ECAP. The Sustainable Oakland program supports Oakland's progress in becoming a more sustainable city. Learn more about the City's Sustainable Oakland program.